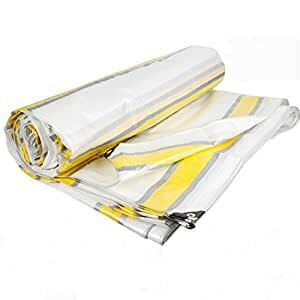 â¤Material: High-temperature PE, which maximizes flexibility and strength, and is coated with an oil-repellent and waterproof layer on both sides to obtain weather resistance and water resistance. â¤ Reinforcement: Reinforce the product in every corner and fix the rust-proof aluminum metal buckle every metre for optimum stability and tear resistance. â¤ Cleaning method: You can wipe with soap cloth or warm water, but not in the machine. â¤ Tip: If you have any questions, please do not hesitate to contact us. Insulation of carports, window sills, roofs, etc. Since the machining is all manual measurement, the error of the finished product is usually 1-6 cm. beg to be excused. Usually we will ship within 1-3 days, delivery time is 15~21 days, if you have any questions, please contact us in time.